Yes, meanings can be lost, but they can also bloom and multiply, can sit heavy in the mouth, their translation complicated by their multiplicity. Yet Elhillo has mastered this task of translation through poetry so wrenching that I had goosebumps more than once while reading this impressive debut collection. Poetry is the tongue these speakers have been seeking. Through it Elhillo demonstrates how entirely new meanings might be created from these attempts to translate experiences across space-time and between languages. 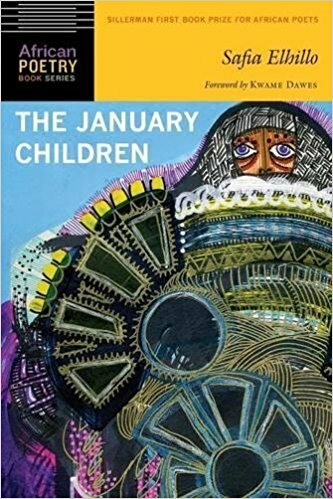 The January Children feels structurally like a song; themes recur like a chorus, heralded by titles that at times sound so familiar that the reader feels as if surely she had just read that poem three pages back. The effect is that The January Children is not linear; it is a series of movements forward and backward, both toward and away from home(s), a constant negotiation of belonging. For instance, in the “talking with an accent about home” poems, Elhillo adapts the observations of members of the Sudanese diaspora she interviewed. Taken together, these poems create a mosaic of experiences of home; in one, “home is / a name / maryland / is my / sudan,” and another speaker observes, “it was easier to just be / something else.” It seems there are as many definitions of home as there are people, even when those people are all from the same land. Another chorus in The January Children is the intermittent dialogue between the speaker and the late Egyptian singer Abdelhalim Hafez in a series of poems whose titles feature Hafez’s name. In his songs to asmarani, which Elhillo translates as “diminutive form of […] dark-skinned; brown-skinned,” the speaker sees herself reflected. It’s a self-identification that feels like a lifeline. I think of how my younger sister and I used to argue about who was the real “pretty girl with ebony eyes” referred to in Stevie Wonder’s “Ebony Eyes.” As an exiled asmarani, or as a U.S. American brown girl of any sort, to see oneself represented in one’s cultural framework is powerful, especially when our belonging feels uncertain. Multiple interviews to be Hafez’s girl unfurl throughout the book until “self-portrait as Abdelhalim Hafez’s girl,” which ends with “[fourteen egyptian girls killed themselves when he died]”. Hafez functions as “‘the loverboy prototype’ ‘the first romantic,’” but the love these poems evoke goes beyond individual romance. Does being Abdelhalim Hafez’s girl mean inheriting the specific heartbreak of diasporic Sudanese loss? “[S]udan broke my / mother’s heart” and “sudan split by a river in two / quartered by new boundaries” Elhillo croons in “the part I keep forgetting” and “talking with an accent about home (reprise).” To be the fabled asmarani of Hafez’s ballads is to be desired, to belong, but also to fully inherit the weighty grief of a mother, and of a mother’s country. The January Children itself is a ballad and is, indeed, “a story older than water,” but it is as refreshing. Like Hafez, Safia Elhillo’s triumph is not that she sings about novel love and heartbreak, but that she does so in an unforgettable voice.